Access Opening — Requires access opening minimum size 24″ wide x 30″ long. Vertical Access — Requires minimum Stair width 22″ and slip resistant surface. Overhead Clearance — Requires minimum overhead clearance 6′-8″ or 5′-0″ with signage. Handrail required on stairways having more than three stairs. All All STORM SHELTERS have a continuous handrail on one side of stairway. Occupant Density — Requires minimum 3 sq ft usable shelter area per occupant. All STORM SHELTERS exceed requirement. Requires minimum 3 hinge attachment points and 3 positive latch points. Requires exterior key accessibility for post storm Emergency Entry by EMS personnel if needed when latches are engaged from the inside. 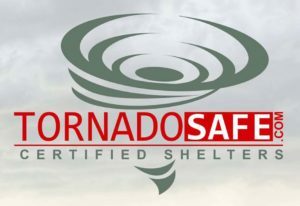 All STORM SHELTERS exceed requirement. Emergency access can be made by removal of full length hinge from outside with 2- 7/16” wrenches. All STORM SHELTERS have been tested by a third party engineering firm for underground structural design. All models exceed the requirements. Windborne Debris Hazards — Requires tornado shelters exposed surfaces to be designed tested to emulate wind speeds of 250 mph. 15-lb sawn lumber 2×4 missiles impacting exposed surfaces less than 30 degrees from horizontal at 67 mph and exposed vertical surfaces at 100 mph. Requires 2 sq. in. or 4 sq. in. of natural ventilation based on location of ventilation ports per occupant. All STORM SHELTERS manufactured to meet or exceed ventilation requirements.